Could Roberts be the next to commit? After a month filled with Ohio State camps, commitments, The Opening, and more, we finally had a relatively quiet week on the Buckeye recruiting front. This week we saw the sole remaining un-committed quarterback on the Buckeyes' recruiting board narrow his list of schools to three. Did the Buckeyes make the cut? We'll tell you later in the notebook. We will also take a look at a group of three prospects who could be approaching a college decision in the likes of Jermaine Eluemunor, Mike Gesicki, and Austin Roberts. There were also a couple of future Buckeyes who received a ratings bump in in the latest top 247, following strong performances at The Opening. One Buckeye commit earned a five star distinction. We'll tell you all about it later in this week's edition of the recruiting notebook. Finally we will take a look into the future and preview the upcoming Friday Night Lights camp which will take place on Friday, July 26th at Ohio Stadium. Bossier City (LA) Parkway quarterback Brandon Harris has narrowed his college choices to Auburn, LSU, and Ohio State as he approaches at July 19th college decision. While I think the Buckeyes still have a chance at landing the star signal caller, I think he's going to end up committing to the Auburn Tigers as he is very intrigued by Gus Malzahn's system, the same one that helped Cam Newton win the Heisman trophy a few years back. There is a group of three prospects, including offensive tackle Jermaine Eluemunor, tight end Mike Gesicki, and tight end/wide receiver Austin Roberts who could be closing in on their college decisions in the very near future. JUCO OL Jermaine Eluemunor will visit #Arkansas before deciding on his college future. Visit scheduled for 7/19. Eluemunor was all set to commit last Friday and I think he would've been a Buckeye if he followed through with those plans. However, he is going to visit Arkansas in about a week before making his decision. Harris is closing in on his college decision. I still like the Bucks in this race, but I wouldn't be surprised if the top JUCO offensive tackle decided to stay committed to UCLA or attend Arkansas. Roberts is another player who could be closing in a commitment. He's visiting Ohio State for the Friday Night Lights camp on July 26th and has the Buckeyes in the lead. I think the wide receiver/tight end hybrid will end his recruitment at the camp deciding to play his college ball for the Buckeyes. Finally, Gesicki could commit to a college in the next month or so. 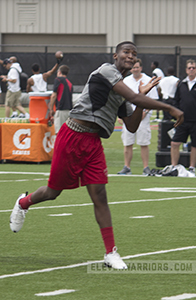 He camped at Ohio State June 21st, earning his offer. Most believe Gesicki will end up committing to Ohio State (95% OSU on 24/7 Sports Crystal Ball). I disagree with this sentiment and think he will end up playing for Penn State in college because I simply don't think there's enough room in this class for both Gesicki and Roberts. There were a couple of Buckeye commits and targets who earned rating bumps in the new top 247 thanks to strong performances at The Opening earlier this month. The player who received the biggest bump was Buckeye linebacker commit Dante Booker Jr., who vaulted all the way up to the number 16 player in the class, earning a five star distinction from 24/7 Sports. Buckeye target Curtis Samuel was also bumped up to a five star. Wide receiver commit Terry McLaurin earned his fourth star and a spot in the top 247 thanks to a strong performance at the Opening. Damon Webb, Kyle Berger, Parris Campbell, and a few others also received a small ratings bump. Good news! There's almost nothing to report in our "Happy Trails" section this week as no major Buckeye target decided to commit to another school. The one commitment I would like to mention is that of Halmer (OH) Patrick Henry offensive linemen Colt Petit who committed to Virginia Tech. The massive linemen received some interest from OSU at one point, but never had a real shot at earning an offer from the Scarlet and Gray. Friday Night Lights, the Buckeyes' biggest football camp of the summer is coming up on July 26th. There will be a lot of top prospects/recruits in attendance. We will see a group from Cass Tech there including the likes of 2015 stars Jayru Campbell and Mike Weber. 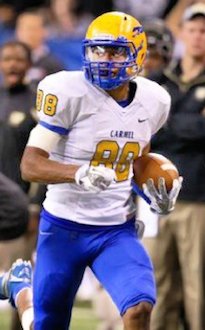 They will accompany 2014 Buckeye commit Damon Webb to Columbus. There will also be two Glenville stars at the camp including the likes of Marshon Lattimore and Erick Smith. I think both of these guys will be Buckeyes when it's all said and done. I don't think either is close to committing though. Other major 2014 players who plan on being at the camp include the likes of Raekwon McMillan, Malik McDowell, Donell Stanley, and a few others. We'll have much more on this camp in the coming days and weeks.